Brain Injury: I remember falling; one moment I was standing in the bright Hawaiian sun and the next I landed at the bottom of an old abandoned dry well. I landed directly on top of my head from about sixteen feet fracturing seven vertebrae, multiple ribs and both great toes. I was alone, except for my two dogs. No one knew where I was. No one would be waiting at home. No one would miss my absence for a few days, and with no water. I would not last long. After somehow climbing out of the well, I would spend the next three days crawling to the highway on my hands and knees; my dogs never left my side. I woke up two weeks later in the hospital after someone found me laying on the highway. i still hadonefoot in the spirit world; I felt like my head was floating in a bowl of Novocain. I knew something was wrong; I could not find words, I had a hard time following conversations and my memories seemed like dreams. 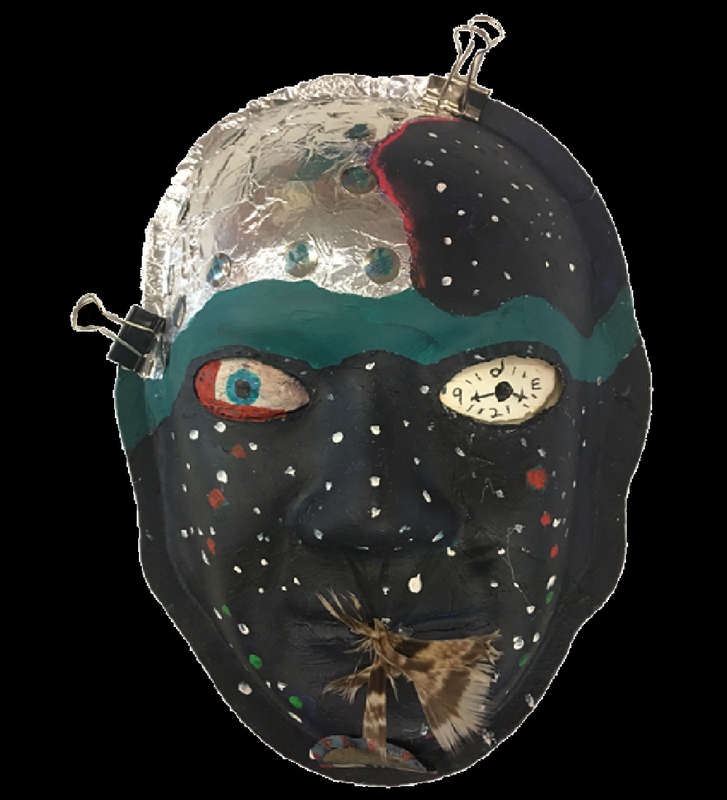 Explanation of Mask: I try to see my TBI as a spiritual journey; it is the only way I can make sense out of it. The foil thumbtacks and paper clips symbolize feeling fragile, pieced together, and protective of my right brain; painting and writing are the only times I feel whole. I remember in old movies people would put on tin foil hats as a way of protecting themselves from alien messages. I get overwhelmed by too much information, and my brain will shut down, I will sleep for days. I have to protect myself from sensory overload. The areas of the night sky dotted with stars and planets are the spirit world. I have lost most of the skills associated with left brain functions, math, organizing, and problem-solving. The left eye wit the clock/compass face depicts my loss of time, numbers and direction. The right eye with the red markings represents the cut in my field of vision sustained from my head injury. Although my hearing and speech have improved, the feather in the mouth is the insecurity I have in any conversation. The green line running horizontally above the eyes is the divide I feel between my body and mind. The silver medal is for the dogs because they deserve one for saving my life by staying with me until the very end. Boo and Lei Lei May, you are good dogs!